In 1926, Tom and Isabel Sherbourne are the solitary residents of Janus Rock, an isolated lighthouse in the ocean off the coast of western Australia. When a dinghy washes ashore carrying a dead man and a newborn baby, duty says they should report it. But what if they kept the child? This heartbreaking debut is a story of dilemmas, responsibilities and consequences, of how people can make the wrong decision for the right reasons – and how they learn to live with their actions. Australia’s Top 100 Favourite Homegrown Reads, 50 Books You Can’t Put Down 2012, Get Back Into Reading, Better Reading Presents Australia’s Top 100 Books for 2015, The Top 100: If You Loved This Book… Then You’ll Love This, Top 10 Must-Reads this Australia Day Weekend, Seven Books to Read Before They Hit Screens Near You, Better Reading Presents… Australia’s Top 100 for 2016, Top 100 2016 Aussie Authors! M. L. Stedman was born and raised in Western Australia, and now lives in London. 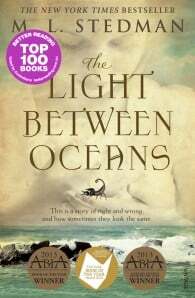 The Light Between Oceans, her first novel, is an international bestseller, having spent well over a year on the New York Times Bestsellers list. As well as being translated into almost forty languages, the book was nominated for the Miles Franklin Award, the Women's Prize for Literature (the Orange/Bailey's Prize), and the Walter Scott Prize for Historical Fiction to name a few, and won prizes including Best Literary Fiction, Best Newcomer and Book of the Year at the Australian Book Industry Awards, and Australian Indie Awards for Best Debut Novel and Book of the Year.